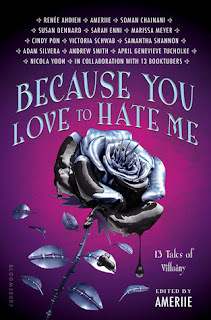 Welcome to the blog tour for Because You Love to Hate Me, an amazing anthology edited by the one and only Ameriie. I've read this anthology and I absolutely loved it. I'm so excited to interview the author one of my favorite stories of the anthology (and one of my favorite authors in general) - Renée Ahdieh! Alongside Renée is her paired booktuber, Christine Riccio, who is so talented and enthusiastic. Check it out! Alyssa: Hi ladies! Thank you so much for joining me today! I am a huge fan of both of you and your work, and I’m honored to have this opportunity. =) My first question – what made you decide to take part in this anthology? Renée: Thank you so much for hosting this! It’s an honor for us, too. I knew I wanted to be part of this anthology the second Ameriie mentioned villains. I’m a huge fan of compelling villains, and I loved the idea of them taking on the central role in these short stories. Christine: It just sounded like a really cool project that hadn’t been done before! I’ve never been asked to collaborate on a published work and a lot of great people were going to be involved! It was super exciting. Alyssa: What inspired your specific prompt/story? Renée: Christine sent me all these amazing prompts for the story. It was incredibly difficult trying to select just one, but I was definitely on a Star Wars kick when I made the decision. Actually, who am I kidding? I’m always on a Star Wars kick. Christine: I mean I only wrote the prompt for the actual story. I was inspired there by Mr Kylo Ren from the new Star Wars film. My “essay,” per se, was inspired by those pieces you see in magazines like: 10 Signs Your Boyfriend is Cheating!! Alyssa: Pitch the story to readers! For fans of ____, if you liked____ try [your story], ____ meets ____, etc. Renée: For fans of Star Wars, if you hate to love Kylo Ren, definitely try this dark anti-hero story. Christine: For fans of ANYTHING EVER, if you liked THAT ONE STORY YOU LOVE try [your story], RENEE’S BRAIN meets CHRISTINE’S PROMPT AND SHORT ESSAY. Alyssa: HA! Love it. :D If you could co-write a story (whether short story, novella, or full-length novel) with one of the other contributing writers of Because You Love to Hate Me, who would you choose? Renée: I’m a huge fan of Cindy Pon and Nicola Yoon. I’d love to write anything with either of them. Christine: Oh my gosh that’s so hard! I admire so many of these authors, but I feel like you have to really know the person you’re co-writing with and so I’d probably join forces with my pal Jesse George. Alyssa: Thank you, ladies! Congratulations on the publication! I'm not usually into anthologies but this one just sounds too good to resist! This is such a creative idea for an anthology - I'm not normally an anthology reader but this one makes me so curious! I'm also a huge fan of Nicola Yoon. I'm so excited to read this anthology. The talent inside and twists on tales I've read are going to be fun to read. "Renée: For fans of Star Wars, if you hate to love Kylo Ren, definitely try this dark anti-hero story." Aw, this is such a great interview! I love watching Christine's videos and Renée Ahdieh is such an amazing writer! Can't wait to read this one! I can't wait to read this one! Great pick! I villainous antholgy, love the sound of this. Nice interview too! I need this book in my life so badly! What a fun interview! I am so happy you had the chance to interview both of them. This sounds like such a fun book. I mean, a story inspired by Kylo Ren? Give it to me! I don't read a lot of anthologies but I'm very interested in this one! Great interview, Alyssa! I'm really excited for this anthology because I do love a good villain! Sounds really interesting! Love to read it!